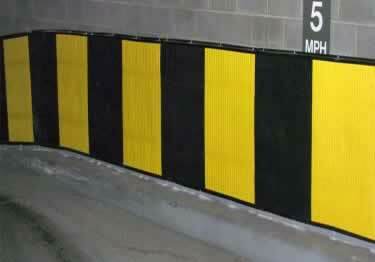 Create a strong layer of cushion to protect walls at risk of vehicle collisions damage with KSC Wall Protection System. The Wall Panels are constructed from ARPRO®, the same material used in automobile bumper systems. ARPRO® is a high-tech material engineered to absorb impact yet designed to be thinner than foam constructed pads, saving space! The Wall Panel System is a modular design, built by using specially designed wall clips that hold the panel at both the top and the bottom. Wall panels have tabs and slots that interlock allowing you to customize to any wall length. Panels: 39.3" Height x 27.6" Width x 1-1/3" Thick Panel, available colors: black or yellow, sold in carton of 3 panels. Wall Clips: 55.5" Height x 27.65" Width, Color: black, Sold in carton of 12. Made from lightweight extruded polypropylene channels, attaches to the wall using standard fasteners (not included). The top rail of the channel includes a small groove to guide the fasteners and provide proper spacing. Each clip spans the width of 2 panels. Clips installed at the top and the bottom of each panel. Clips may also be used to box the end of the run of panels. Measure in inches, the length of the wall, divided by 27.67 that equals the number of panels needed. The number of panels needed divided by 3 equals the number cartons of panels. Length of the wall, divided by 27.67" equals the number of wall clips needed (top and bottom included). The number of Clips divided by 12 equals the cartons of clips needed. Create a strong layer of cushion to protect walls at risk of vehicle collisions damage with KSC Wall Protection System. The Wall Panels are constructed from ARPRO®, the same material used in automobile bumper systems. ARPRO® is a high-tech material engineered to absorb impact yet designed to be thinner than foam constructed pads, saving space!